Recognition of South Ossetia and Abkhazia as independent republics by Nicaragua and the Russian Federation. Georgia loses control over parts of Abkhazia (25%) and former South Ossetia AO (40%) it previously held. In South Ossetia: 10,000–12,000 soldiers. Total: 18,000 soldiers, 10,000 reservists. The 2008 South Ossetia war is a military conflict that started on 8 August 2008, between Georgia, South Ossetian (and Abkhazian) secessionists and Russia. South Ossetia and Abkhazia are territories within Georgia that declared independence from Georgia and have been acting in a de facto independent capacity since the early 1990s. Neither state has been diplomatically recognised by any member of the United Nations. The conflict began on August 8, 2008, after Georgia claimed South Ossetian separatists had broken a ceasefire by attacking villages, although South Ossetian officials deny that they attacked villages. Georgia launched a military offensive to surround and capture the capital of South Ossetia, Tskhinvali. Russian military troops entered the war at the side of South Ossetia and won the conflict. Georgia launched the Georgia versus Russia (Hague court application, 2008) in the International Court of Justice. The war ended on Saturday 16th, 2008. ↑ "Statement by President of Russia Dmitry Medvedev". Russia's President web site. 2008-08-26. Retrieved 2008-08-26. ↑ "El Presidente de la República Nicaragua Decreto No. 47-2008" (PDF). Retrieved 2010-06-22. ↑ Tavernise, Sabrina; Siegel, Matt (2008-08-16). "Looting and 'ethnic cleansing' in South Ossetia as soldiers look on". Melbourne: Theage.com.au. Archived from the original on 2009-08-16. Retrieved 2009-05-10. ↑ Hider, James (2008-08-28). "Russian-backed paramilitaries 'ethnically cleansing villages'". London: Times Online. Retrieved 2009-05-10. ↑ "World Report 2009 Book" (PDF). Archived (PDF) from the original on 8 June 2010. Retrieved 2010-06-22. ↑ 00:49. "RIA Novosti — World — S. Ossetia says Georgian refugees unable to return to region". En.rian.ru. Retrieved 2009-05-10. ↑ 8.0 8.1 View all comments that have been posted about this article. (2008-08-16). "A Two-Sided Descent Into Full-Scale War". Washingtonpost.com. Retrieved 2009-05-10. ↑ "Senior MoD Official Testifies Before War Commission". Civil.Ge. 2001-07-01. Retrieved 2009-05-10. ↑ Solovyov, Dmitry (2008-08-09). "Russian general wounded in Georgia's rebel region". Reuters. Retrieved 2008-08-09. ↑ Bahrampour, Tara (2008-08-14). "A Convoy Heads for Gori to Investigate Rumors of Plunder". The Washington Post. p. A10. Archived from the original on 2009-05-28. Retrieved 2008-08-14. ↑ (Russian) Кулахметов, Марат. Lenta.ru Lentapedia, 2006. ↑ (Russian) Генерал-майор Кулахметов Марат Минюрович. Министерство обороны Российской Федерации, 2007. ↑ "Войсками Южной Осетии командует бывший пермский военком генерал-майор Василий Лунев / 11.08.08 / Новый Регион – Пермь". NR2.Ru. 2009-04-07. Retrieved 2009-05-10. ↑ "Гюижеб, Юмюрнкхи". Lenta.ru. Retrieved 2009-05-10. ↑ Liklikadze, Koba. "Lessons And Losses Of Georgia'S Five-Day War With Russia - The Jamestown Foundation". Jamestown.org. Retrieved 2010-06-22. ↑ "The Chronicle of a Caucasian Tragedy". Spiegel.de. Retrieved 2009-05-10. ↑ 20.0 20.1 Barabanov, Mikhail (2008-09-12). 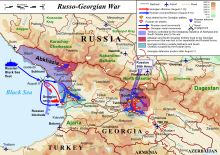 "The August War between Russia and Georgia". Moscow Defense Brief (Centre for Analysis of Strategies and Technologies) 3 (13). https://www.webcitation.org/5fm4fGQ5j. Retrieved 24 December 2011. ↑ Krasnogir, Sergey (8 August 2008). "Расстановка сил" (in Russian). Lenta.Ru. Archived from the original on 9 August 2008. Retrieved 2008-08-10. ↑ "12 Georgian soldiers exchanged for convicted criminal". The Messenger. 2007-09-28. Retrieved 2009-05-10. ↑ "Russia lost 64 troops in Georgia war, 283 wounded". Uk.reuters.com. 2009-02-21. Retrieved 2009-05-10. ↑ "Georgia holds 12 Russian servicemen captive - RT Top Stories". Rt.com. 2008-08-18. Retrieved 2010-06-22. ↑ "Deceased victims list". Ossetia-war.com. Archived from the original on 2009-05-28. Retrieved 2009-05-10. ↑ List of killed South Ossetian citizens as of 04.09.08, Список погибших граждан Южной Осетии на 04.09.08, 4 September 2008 (Russian); Russia scales down Georgia toll, BBC News, 20 August 2008; Russia says some 18,000 refugees return to S. Ossetia, RIA Novosti 21 August 2008. Accessed 2009-05-28. Archived 2009-05-28. ↑ "Saakashvili: Russian 'rampage'". YouTube. 2008-08-13. Retrieved 2009-05-10. ↑ "Russia trains its missiles on Tbilisi". The Australian. 2008-08-19. ↑ Fawkes, Helen (2008-08-20). "Despair among Georgia's displaced". BBC News. ↑ "Human Rights Watch Counts South Ossetian Casualties, Displaced". Deutsche Welle. 11 August 2008. Retrieved 2008-08-11. ↑ "The goals behind Moscow's Proxy Offensive in South Ossetia".